What will your next FDA recall cost? I'm only asking because FDA medical device recalls are on the rise. FMEA may not be enough. I have a solution that will lower your risks and save lives. The white-paper about it’s free. Menlo Park Software. Thanks for visiting. CEO's, see a special message for you at the end. Click to jump. THE BLAME GAME: Who is responsible for the rise in FDA recalls? In The Black Swan by Nassim Nicholas Taleb, the author says "That awareness of a problem does not mean much--particularly when you have special interests and self-serving institutions in play". Certainly this rise in recalls is a problem. Let's look at the players and special interests. Back in 2016, MD+DI published an article titled “What’s Behind Medech’s Recall Epidemic?” by Joshua R. Dix, Suraj Ramachandran, and Darin S. Oppenheimer. It reported that FDA recalls hit an all-time high in 2014. It happened again in 2017 (See the chart, above). The 2016 MD+DI article blamed device manufacturer risk management for recalls: "the culture, the shallow understanding industry-wide, and the inability to tie risk management into quality management systems". This is self-serving. They have nothing new to offer. Just exhortations to do better while they continue to write and publish more papers. It was unfortunate that the authors missed the true economic reason for the rise in recalls. Also, that their background was not in statistics and process improvement. They would have seen the right problem and the right solution sooner. Outsource vendors and consultants are only too happy to accept your business. But, their vast experience using incorrect methods will not do your risk management any better or cheaper. They have no incentives to do so. Also, their activities are removed another layer from your development process. So, they have less than perfect communication with your team members. And, present more of a bother for the information they need. Software vendors come in two flavors. The oldest are mainframe modular QMS solutions that have been ported to personal computers or servers to be accessed over the internet. They will typically have a risk management module that comes with a single purpose database, screens to manage it and reports. They may even have a collaboration module and brag about having single sign-on to go between the more than 20 modules. Project management tools are seldom integrated, more often separate with ad hoc aggregations. The newer software tools tend to be QMS extensions of requirements management tools that integrate with development environments and may even connect to debugging tools like Bugzilla and Jira. Risk management is rarely integrated and more often absent. The FDA provides lots of research and information. But, it is up to the industry to make the best of it. Benefit-Risk Assessment has not made it explicitly into Part 820, but the FDA has published about it in non-binding articles. I have been an external assessor and internal FDA regulation auditor. And, I can tell you that you are always allowed to do more than regulations require. Regulations are always the minimum required. So, the FDA will require that you do "risk analysis". But will not prescribe the exact processes you use. You are free to use any methods you deem appropriate. You can use any measure you believe to be proper. (e.g. detection). You just need to identify the method(s) used and document them in your Design History File(s). 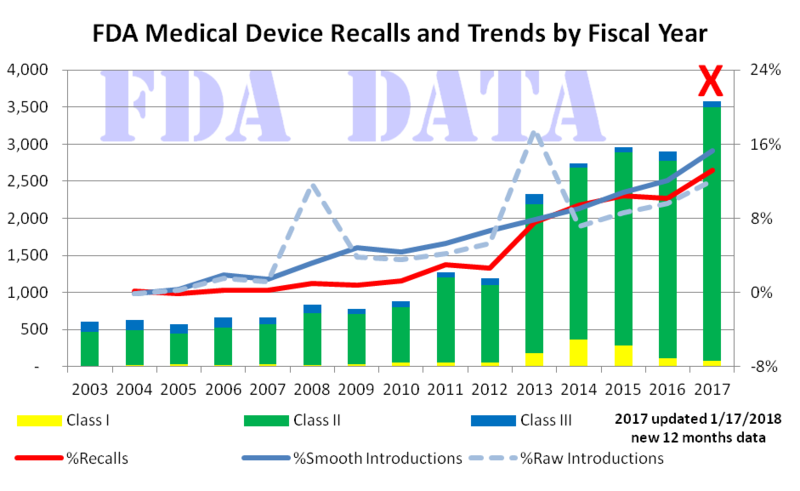 The FDA Medical Device Recalls chart above shows what's really going on. There has been a rise in recalls since 2012, but this correlates 95% with the number of medical device introductions. More devices means more recalls. It's more economic than epidemic. Doing more of the same will not work. Some new method is required. With a new method, manufacturers can choose to iteratively and incrementally to reduce failure mode probabilities below global and proprietary standards; apply Benefit-Risk Assessment; integrate risk management expertise with deep knowledge of devices and components; and increase the scope, coverage, depth, participation and specificity of risk reviews. With my new software tool, manufacturers will more easily manage device faults/failure modes and report on them. Also, design and facilitate meetings that reap the synergy of integrated risk management expertise with device knowledge. And, design and facilitate meetings to exploit the synergy of wider scope, coverage, depth, and participation of risk reviews. Menlo Park Associates is a management consulting firm specializing in process improvement. Classic risk management has failed the medical device industry. I researched the real cause of the rise in FDA recalls. Then I developed a new method of risk management that finds and mitigates more failure modes, which prevents FDA recalls and saves lives. This company owns Menlo Park Software, which created a prototype 21st century project management platform using social media software technology. The software supports the new risk management method. In addition, it improves FDA regulatory compliance, which eliminates citations and improves FDA inspection outcomes. 2017 was the worst year ever for device recalls. There was never any epidemic. Only just economics. More devices mean more recalls. New device company risk management is not any better. Old companies still struggle. The blame is unfair. But the problem still exists. And, we need a fix. made much better by a supporting software tool. Maybe you just don't worry about FDA recalls. That's great. Could it be that you never got any and never will? Terrific! People with perfect records need not worry. Your current processes, practices and QMS software are more than adequate. Why change anything? New hair-brained ideas are not worth the risk. What, me worry? OK. Probably this solution won't apply to you. You might be too small or too big for this solution to work. That presents a very big risk. Good call. Stay safe and keep looking. Something will come along and fit your needs exactly. There are lots of software companies out there that say they will. You can believe them 100%. 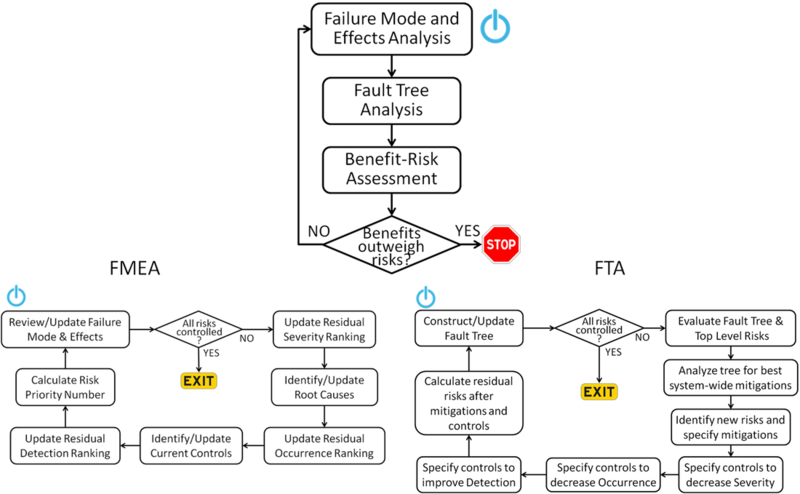 You already used Fault Tree Analysis (FTA). Fantastic! Perhaps you use it or tried it and failed. I know it's complicated and a lot of work. I can certainly understand giving it up. Hardly anybody uses it now. FMEA is all over the literature. FTA is rare. Benefit-Risk Assessment more rare. It can't be worth the trouble. Sound reasoning. You have achieved risk management synergy. Excellent! Team members with device knowledge are already integrated with risk management experts. This is a very mature practice that few can pull off. Getting the right people into the right meetings with the right agendas 100% of the time is difficult. Keep up the good work. Risk management is all outsourced. Good for you! This may be why you don't experience FDA recalls. Or, keep the number down to a manageable figure. It puts a pinch on risk management synergy, to be sure. And, it's very expensive. But, hey, it does the job. FDA regulatory compliance all outsourced. Neat! This can also be expensive. And, the compliance folks still need to bother team members for documents and information. Everything is a compromise, I guess. KEEP READING! It's not CRAZY! It's innovative. My solution has a new method of aggressive risk management. See below at right how a very big recall could have been prevented. I recently developed a new aggressive method of risk management for medical device companies that combines Failure Mode and Effects Analysis (FMEA) and Fault Tree Analysis (FTA). Use it to prevent FDA recalls. Aggressive risk management paper. Just send your name and work email to get your PDF. Then we can interview and you get your DEMO. An FMEA could miss faults not knowing the interrelationships an FTA would discover. Classic FMEA does not use probabilities. A large number of faults creates a paperwork burden to manage information like which team members have device knowledge, which have risk expertise, and all the faults and their details. Draeger Medical recalled its disposable VentStar and ID Breathing Circuits and Anesthesia Sets due to a risk of the devices being incorrectly assembled, resulting in a short-circuit in the breathing hose. 3) such a check might not notice the incorrect assembly and the resulting defect. There would be any number of good mitigations. They would require meetings for review of all the potential faults with all the right stakeholders. So, my new software would have enabled the management of many faults and their details and facilitated such meetings. My SaaS' software can manage many faults and their interrelationships for deep FMEAs. It can create synergy by bringing together people with risk expertise and people with device knowledge. Classic FTA results in probabilities for benefit-risk assessment and device safety and reliability. The software systematically creates reports, meeting agendas and minutes as compliance evidence. 1. The interview has two sets of questions. The first 10 or so have specific short questions. 2. These short questions are not open-ended. But, they may require some research. 5. Survey questions not answered will be asked as part of the interview, with its deeper, open questions. 6. So, either way the survey questions are answered, time will be saved in the interview. 7. The next step is to schedule the interview. Click Button 3 to arrange a convenient time. 8. If the interview is by phone, then that ends the session. 9. If the session is on-site, or by Webex, then a presentation and DEMO are possible. And, don't forget you get free use of the software forever when it has been released, including support. Read about the original FDA Recall Epidemic. The FTA & FMEA combination is a miracle because they each contribute parts needed for safety and reliability that fit with the other. Responsible people like you are busy folks. Like me, you might work weekends. Especially on less urgent tasks that pay off in the future. Like those journals and industry magazines. Those of you deciding to invest a half-hour or so will find Saturday hours in my internet schedule. Not every Saturday, and not every hour. But, enough opportunity so you can contribute and not feel guilty of taking time from fire fighting and other urgent issues. PLEASE URGE YOUR PEERS TO JOIN YOU IN THIS RESEARCH. I was in the medical device industry some years ago. The world has changed. The interview's purpose is to characterize your current troubles and priorities. And, devise solutions in the industry from your point of view. For this, I am gifting the method I have developed that should be helpful today. The 1st 100 who interview absolutely get the FREE demo and a copy of the new method pdf. Your views are important. A diversity of views is needed. Claim your FREE aggressive method paper and jump start your efforts to make a very large improvement in your risk management practices. Take your shot. Then, if you want, donate your time and views in a one hour interview. You will also get to influence the design of new methods and tools. Make sure your needs are addressed exactly. Ensure your enterprise profits from the close match to features and practices. Share with your friends and peers. CLICK HERE TO SEND ME AN EMAIL WITH YOUR QUESTIONS.